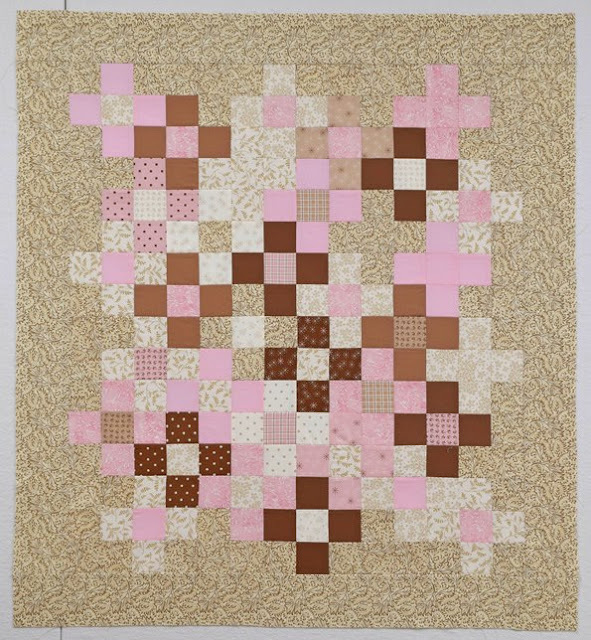 I decided to make a baby quilt using the pinks and neutrals from the Mistletoe Lane mini charm packs plus some other fabrics shown in the Sunday Stash #6 blog post along with the quilt top in progress. The quilt top measured 28 1/2" x 32 1/2" without the 2" borders I had originally planned on adding. Wanting to make the top a little larger, I cut the borders 3 1/2" instead of 2 1/2". It would only add another 2 inches, but thought it make it a nicer size. Well, wouldn't you know I miscut the first strip and did not have enough fabric to cut an extra border. So, I pieced it! It's not noticeable, but I know it is there. The piecing took much longer than I thought it would and I am glad it is done. The top measures 34 1/2" x 38 1/2". I will still need to piece the backing because I do not have a enough yardage for one piece. And from there on to the quilting. Hopefully, I am on track to meet my One Monthly Goal (OMG) hosted by Heidi at Red Letter Quilts. 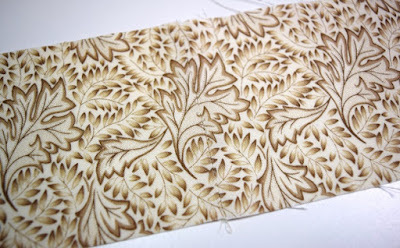 Linking up to Whoop Whoop Friday, Fabric Frenzy Friday, Whoomp There It Is, and Show Off Saturday. You have done such a good job on piecing that border that I really had to examine it carefully to find the join. The thing that gave it away was the whisker of the seam allowance you can see peeking out from behind the quilt. I am glad that with a bit of piecing you did have enough fabric to get a bit more size for the quilt! I think it looks great, I could not even find the join and after piecing you probably won't be able to see it. I looked and looked and looked at the finished quilt and couldn't see where you pieced the border. I know you know it's there but it doesn't show and I'm sure the new baby and his/her mother will either not notice or think nothing of it if they do. I think it looks great with the wider (rather than a narrower) border. Well done! It is really cute - I like the colors! With the extra wide border, the blocks seem to float. Wonderful colors, and very sweet for a baby quilt. Nice job! Amazing that pieced border!!! Complimats and congrats with this great finish!! I couldn't see where you pieced it if it was in the strip you showed. I feel your pain as I had a day full of miss information and problems yesterday! Thank goodness today is a new day. You did an amazing job piecing that border - the join is hardly noticeable! I think this is a really sweet baby quilt. Wonderful job. Good thing that was such a forgiving fabric. I can't see any piecing even with your close shot. Very pretty quilt too. Very nice Paige. Thanks for linking up and good providence w/OMG! P.S. Your piecing is so perfect that nobody would notice unless you showed them ad they looked really, really closely. Hi Paige..I'm retutning the visit and glad I did! I love your pinks with neutals...great combo huh.